So, after all of your glorious feedback on the white v. white oak vanity issue I was all hyped up and excited about pulling the trigger on the white oak vanity. Living on the edge! Trying something new! It’s going to look awesome! 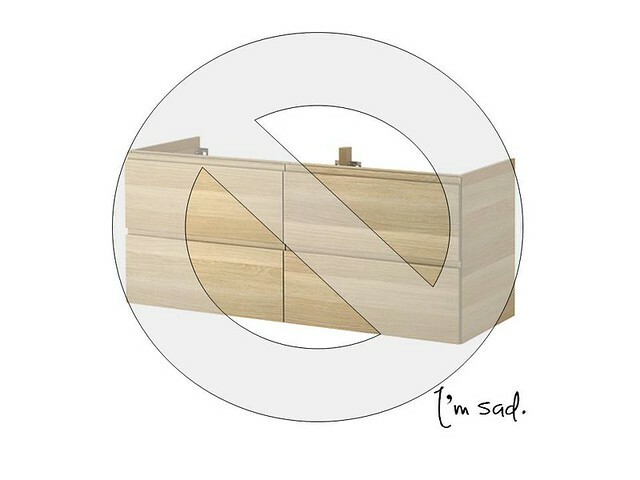 We set out to Ikea on this morning to take advantage of the Ikea Family sale, only to discover that the white oak vanity line is being phased out. As in, they don’t have a white oak vanity in the bleeping size that I need. Poor Austin, the sales clerk that was helping me. I should send him a fruit basket. So, my choices were to (1) opt for a smaller vanity in white oak and risk the vanity looking dinky, or (2) choose another color vanity in the size that I need. P.S. I also contemplated using two small vanities, but I decided that would look weird. Oh, man. It’s good to know that’s been discontinued as it was an option for our renovation; we won’t be ready for vanities until January. Maybe your Ikea will still have a few, or at least that’s my hope! They still had some at our Ikea, but they weren’t the size we needed. Thanks for passing along that DIY vanity, it looks awesome! Liz, that is just awful! I am so sorry this happened. What a frustrating disappointment! Try the black brown one in the space. You might find you like it.. I haven’t seen it but if it’s just a dark wood look, it could bring that warmth too. Or maybe you will like the contrast and do a black and white bathroom. Hoping for a happy accident! Do you think it might be available in another Ikea store somewhere? I could check the Pittsburgh one, but that’s all the way across the country from where you are, I think. Thanks Kathleen! Other than Frisco, the two closest stores to me are Round Rock (outside of Austin) and Houston, and neither of them have it. And you can’t order it online, either. Grr! Bummer! Have You Considered The High Gloss Grey Cabinet? I Think It Might Look Nice, But The Dark Wood Could Be Wonderful. I’m Very Curious To See What You Do. I know that you probably don’t want to drive again but have you tried the Houston Ikea? When Round Rock didn’t have the stuff we needed for our kitchen, we were able to drive to Houston and get the missing bits. They checked Houston’s inventory and unfortunately they don’t have it either – curses! aaaaaaah! my rehab is running behind, but I’ve planned a bathroom around this vanity! I want to run to Ikea RIGHT NOW! There is hope! Over the weekend I did what all of y’all were saying to do and checked the inventory at another store (which the guy helping me at Ikea did as well) and SUPPOSEDLY the next closest store to me has two. COULD IT BE TRUE?!?!? My fingers are crossed that there’s one at your Ikea, but BUY IT NOW, ha! We ran into issues when trying to create an IKEA project similar to your issues. It seemed like every idea we came up with required specific pieces and something wasn’t the right size. It was quite annoying, so I sympathize.